The Battle of Gettysburg has been written about in hundreds of books, with each author trying to dissect every part of the three-day engagement. I am not going to attempt that. My focus is to follow an ancestor who happened to participate in one of our nation's bloodiest and most crucial battles. His name is Thomas Lyon Grafius. Thomas was born in 1842, the son of Joseph and Mary (Woodward) Grafius. Joseph came to Montoursville, Pennsylvania, around 1850 and lived at 433 Broad Street. Thomas was named after a prominent physician of that time, Thomas Lyon. At the outbreak of the Civil War in April, 1861, the nation thought there might be a little flexing of muscles on both sides of the conflict, but did not realize there would be terrible death and destruction that would ravage the United States and its people. In September, 1862, Thomas L. Grafius joined the 143rd PA Regiment, Company K. The unit was originally organized in July in Luzerne County, but Companies H and K were added later. This regiment was part of a unit nicknamed the Bucktails, because a number of the men wore deer tails attached to their hats. Between September, 1862, and June, 1863, this regiment was attached to the 1st Corps, 3rd Division, 2nd Brigade. They played a behind-the-scenes backup role around Fredericksburg and other areas in Virginia. In mid-June, 1863, the Union command received intelligence that Robert E. Lee might be moving his troops northward. General Lee decided to take the war to the North for two reasons. 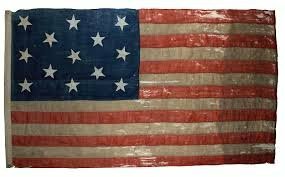 First and foremost, he wanted the citizens of the northern states to put pressure on Washington, D.C. to come to a reasonable truce and end the war. The other reason was to replenish his army's stores of food and other supplies, as Virginia was depleted due to all the destruction that took place in that state. The Confederate Army was able to travel up the Shenandoah Valley without being noticed. At the end of June, 1863, they passed through Maryland and into Pennsylvania. This surprise move made the Union forces play catch-up to intercept the Rebels where possible. In Harrisburg, Govornor Andrew Curtin made a plea to the Pennsylvania citizens asking them to form militias to come to the aid of the state. Thomas's three brothers (William, Joseph, and George) enlisted in the local militia and were sent to protect Harrisburg. The Confederate cavalry had almost reached the town of Camp Hill when it met with some resistance from militia units. Meanwhile, the main branch of the Rebel force was near Gettysburg. In fact, they were northwest of the town. A Union cavalry under the command of Colonel John Buford spotted the lead forces. 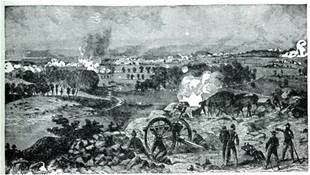 Buford ordered his men to dismount and take positions. General Lee had given orders to his officers not to start an engagement until all his troops were at hand. Col. Buford had other plans. His men fired on the approaching Rebels who then returned fire. More southern units came into the fray, outnumbering Buford's troops. Some of the Union's 1st Corps came in time to support the cavalry. One of the first units to arrive was the 143rd Regiment, along with the Iron Brigade of the 1st Division. They fought for several hours along McPherson Ridge, going back and forth, charging, and then retreating. The Confederate troop strength became too much for the Union forces, so they moved back to Seminary Ridge. While withdrawing, the color bearer kept turning around and shaking his fist at the Rebels, although some say he was making another gesture. Whatever the case, Sergeant Benjamin Crippen was shot and killed. However, he managed to hand off the company banner before dying and a monument to the 143rd and Sgt. Crippen now marks the spot in Gettysburg. After the Union troops reformed on Seminary Ridge, more reinforcements of the 1st Corps arrived, but the Confederates had even greater numbers. The Rebel cannons outnumbered the Federals, and they were very effective. Federal units were smashed. Hundreds were being killed every minute. As a last resort, orders were given to retreat south and head for Cemetery Hill. 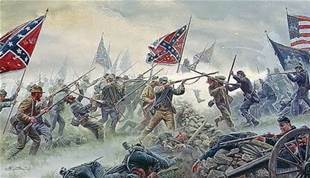 To get there, the ragtag troops had to run through Gettysburg and try to defend their backs in the process. The 143rd, along with the other shattered units, made it to the cemetery. The fresh reinforcements had already set up a defensive perimeter along Cemetery Ridge. This allowed the weary units to regroup, get some food, and to rest. It was then that the 143rd realized they had lost over half their men (250) in the day's fighting. Other units fared no better. Thomas and his fellow soldiers likely did not get much sleep that evening thinking about the fierce fighting they had endured and about their buddies who were killed. The unit spent the night between Cemetery Hill and Culp's Hill. On day 2, July 2nd, both sides had moved in more reinforcements, and each was bracing for what might happen next. 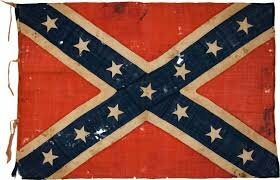 General Lee had a plan to attack both ends of the Union line at the same time in order to find a weak point. The new Union commander, George Meade, liked his defensive line. He could shift his troops to either flank if needed. Lee's plan would have spoiled that defense. Confederate General James Longstreet was to attack the southern flanknear Little Round Top, and other divisions were to hit the northern right flank at Culp's Hill. The plan did not go as Lee hoped, as his southern troops attacked before the northern assault began. More Union troops were able to shift attention to the Wheat Field, the Peach Orchard, Devil's Den and Little Round Top. Later that afternoon, the assault on Culp's Hill began. Dozens of Confederate cannons fired on the position, and many of the rounds rained on the 143rd. The Union forces had dug in fortified positions on Culp's Hill, but the Rebels kept pushing despite not gaining any ground. The Confederate units finally retreated, and nightfall brought semi-calm to the battleground. On the morning of July 3rd, the troops on both sides regrouped. More reinforcements had arrived overnight, so both armies were at full strength. General Lee made the decision to mount a frontal assault, much to the dislike of General Longstreet, who favored a defensive position like the one used at Fredericksburg. The attack took place and two divisions under the commands of General George Pickett and General Petagrew marched off toward the center of the Union line. Prior to the launch of the assault, the Confederates fired hundreds of artillary rounds in an attempt to crush the Union defenses. The 143rd had been repositioned to the left of a copse of trees; that location was now the target of this attack. Due to all the cannon fire from both sides, the valley was filled with gunpowder smoke. No one could really see an intended target, and Pickett's and Petagrew's forces had to march over open ground, a distance of almost a mile, to reach the Union line. While the Confederates were approaching them, the Federal cannons started knocking out sections of troops. When they were close enough, the musket fire commenced. Soldier after soldier fell to the ground, but the Rebels kept coming. A portion of the Southern units made it to the Angle at the copse of trees. The 143rd had to respond with other regiments to push back the advance. This response was sufficient to force thesouthern troops to retreat. The battle was over. Both sides kept a watchful eye for any further action, but none occurred. During the evening, General Lee had his army return to Virginia. On July 4 and 5, Thomas and his regiment helped gather munitions and bury the dead. A week later, his unit was sent southward to catch up with Lee's army. Over the next year and a half, the 143rd was replenished with new troops and was involved in minor skirmishes until Lee's surrender in April, 1865. Thomas, who started his military service as a private in 1862 and was promoted to corporal, sergeant, and finally First Sergeant, was eventually discharged in June, 1865. He returned to Montoursville and married Sarah Jane DeReemer in November, 1865. After their second child was born, Thomas and Sarah, with their children Frank and Gertrude, decided to move out west. He was given a grant of 160 acres for being a veteran and put his stakes down in Shelton, Nebraska. The couple had one more child, a son Charles, after starting their farm. Later in life, Thomas gave his farm to his eldest son and then became a telegraph operator for the railroad company that built through the area. Thomas died November 18, 1908, and is buried in Nebraska. His grandchildren moved to California, where that branch still resides. Thomas L. Grafius (listed incorrectly as T.L.Graffins on the monument*) and the rest of his 143rd comrades are immortalized on the Pennsylvania Monument in Gettysburg, PA, for their valor and their dedication to preserving the Union. A story of childhood friendship and loss. Copright Joseph Grafius, South Williamsport, PA 2010 Return to the top of the page.